Haymarket, Scotland’s fourth busiest train station, has received a major refurbishment and extension. 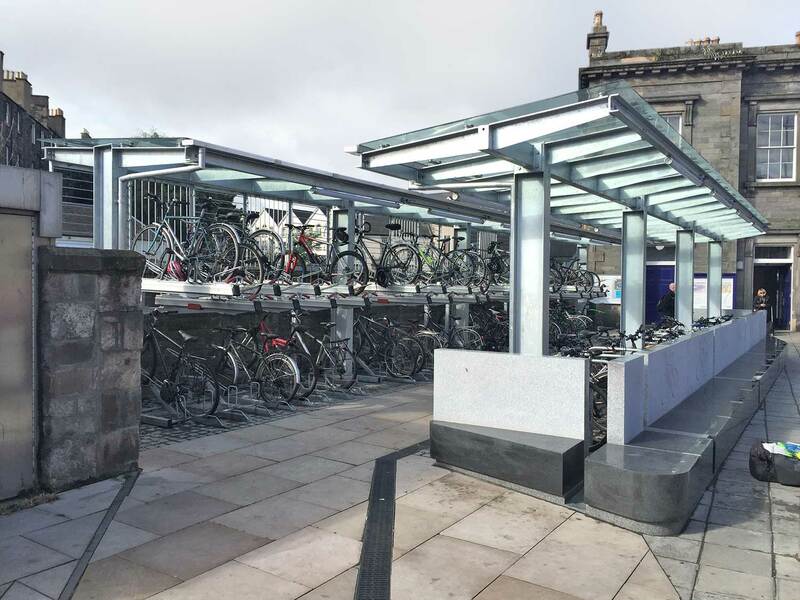 The new transport hub in Edinburgh’s West End has been created to accommodate a predicted 6 million increase in passenger numbers. The project included the refurbishment of an existing Grade A listed station building dating back to 1842. The new concourse building was constructed in a former car park adjacent to the station. This allowed for the project to be run while the station was fully operational. The vision for Haymarket station was to provide a modern station facility to celebrate the experience of modern rail travel. The new additions to the station will enable it to become a transport interchange hub providing enhanced connections with the bus and tram network. The prominent galvanized sections along the platforms will be able to withstand the daily commuter traffic that will spill onto the platforms. The extra station capacity and facilities will address increasing passenger numbers travelling to and from Haymarket. The new concourse building which bridges the platforms and rail lines, was constructed in a former car park adjacent to the station and resulted in two 110 tonne modules being lifted into place overnight. This allowed for the project to be run while the station was fully operational with minimal disruption to train services. The £25 million revamp has added a state of the art facility that has tripled the concourse floor space to 8,700 m, having been designed to cater for a predicted 125% increase in passenger numbers over the next 15 years. A series of escalators, bridges and staircases connect the new steel and glass structure to existing platforms. The overriding concept was to create an open environment with passenger experience at its core. The new concourse, ten times the size of the original space, has increased the amount of natural light that floods the space, providing easy access into and out of the station. Digital screens are present throughout the station that complement the new electronic arrival, departure and information terminals. Ten million passengers are forecast to be using the transport hub each year by 2030. The main Haymarket Terrace access to the station will also service the site’s new tram stop. Galvanized steel plays an important role within the new expansion of Haymarket. It has been used not only for its traditional uses; signaling gantries and security fencing but has been incorporated in several ways at platform level. Galvanizing has been used not only for its traditional uses; signaling gantries and security fencing, but has been incorporated in several ways at platform level. Galvanized steelwork was used for the main frame at platform level. 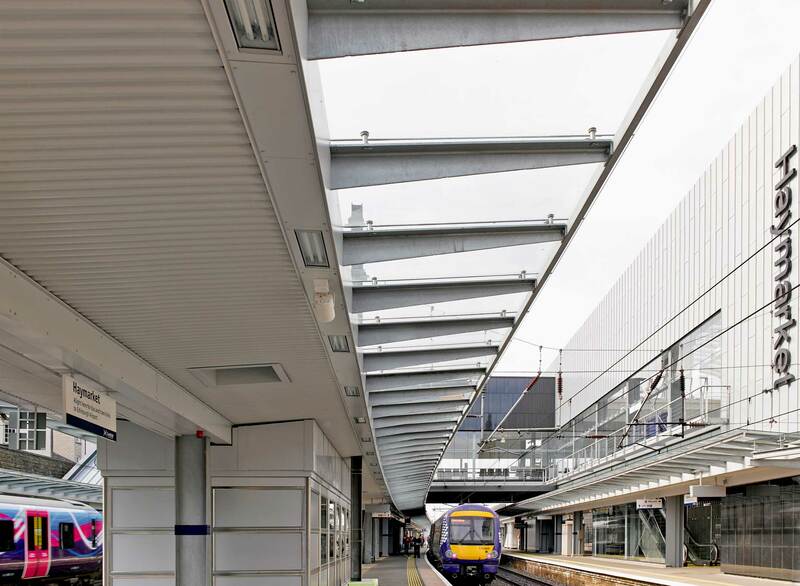 The canopy that runs along the length of the platforms also incorporated galvanized steel sections that support the glazing. Not only does the new transport hub connect to the bus and tram network, it is also cycle friendly. It is also used within the maintenance walkways across the rail tracks and the under-croft security fencing. A striking feature, particularly at platform level, is the skillful blending of the palette of materials. Galvanized steel sits alongside glass, aluminium and painted sheet steel.